So begins a poem about Picasso. But was Picasso spiritual? The question is simplistic and could easily be answered yea or nay based on arbitrary criteria, facts marshalled, or works cited. A more interesting question is: What is there that’s spiritual in the works of Picasso? He was an extremely prolific artist, so this could be the subject of a book-length manuscript. Let’s examine a few facets of his work. I’ve always loved his Old Guitarist ever since I first acquired a cheap print of it as a teen. I don’t suppose I’m much of an ascetic; still, I used to practice guitar until my fingers sported calluses, which was a status symbol among the crazed guitarists of the period. If you claimed to be a guitarist, other guitarists would grab your left hand and examine the fingers carefully. “Yeah, you’re a guitarist,” they would grudgingly admit, as if granting entrance to a secret club whose members all bore the same tattoo. 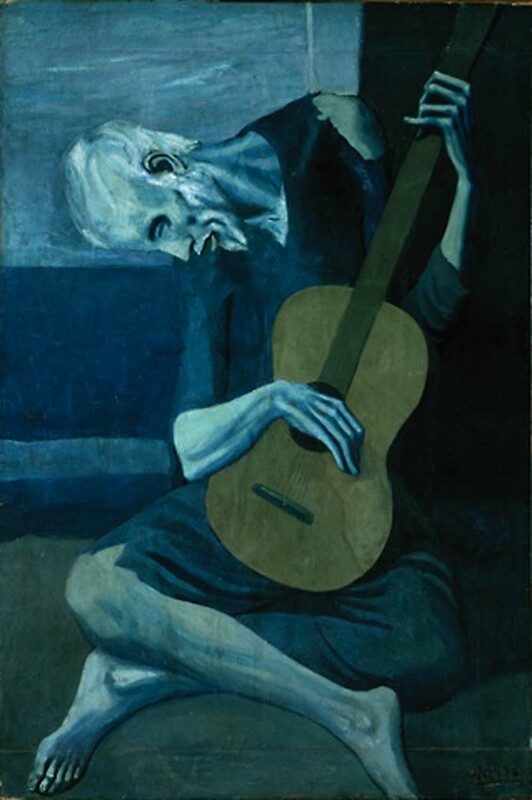 The Old Guitarist is from Picasso’s blue period, but I never found this picture depressing (if that’s what blue means to some people). I do find it ascetic in an admirable, spiritual sort of way. The shapes and colours create their own world, and the figure seems to move counter-clockwise in an elongated oval, with remarkable harmony and balance. By being nobody, this guitarist somehow manages to be in tune with the universe. He’s lost himself in the music to such an extent that there’s nobody home anymore, just the music — a state of zenlike abandon. To be precise, he has no frets (as Douglas Hofstadter would say). His head could easily have been stolen from a crucifixion picture, and I doubt this fact was lost on Picasso, who some claim was as Catholic as the Pope. (If so, he hid it well.) Picasso is a complex character, and any one theory purporting to explain him is bound to be superficial. Yes, there’s an element of autobiography in many of his pictures, but not always the most interesting ones. Something like The Old Guitarist is pure art — a world to be entered into and experienced, an object of meditation not idle speculation. On that basis, I pronounce it spiritual. 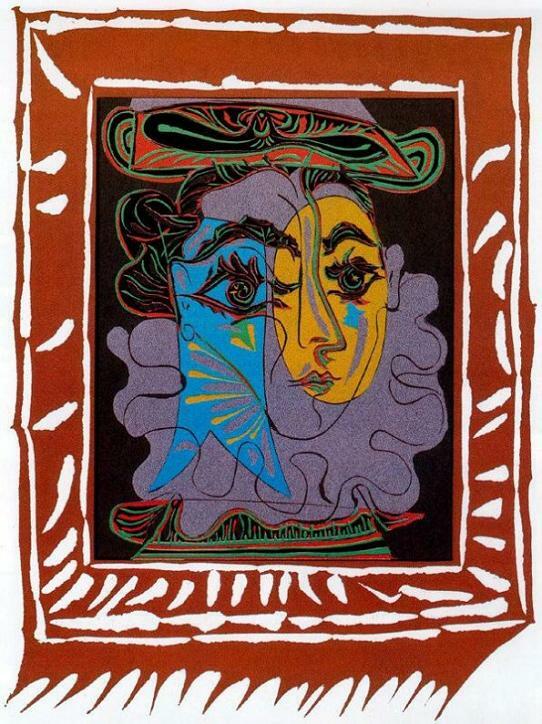 Picasso the dramatique shows us “the truth revealed from within.” He darkens the sky and brings out the stars. He’s profoundly unhappy with the first version of the painting, but uses it as a springboard to create a second (much different) one. Comparing the two is like a mini-seminar in modern art. Picasso crams the first with conventional detail, then reduces and simplifies so that the second communicates more pure emotion. The blue of the sea and orange of the sun are reduced to patches of colour, and the joy that people feel is personified by male and female stick figures who dance with joy and are united. This is not unlike the writing process, where a writer may stuff the first draft with superfluous detail, then prune away much, keeping only that which is expressive and essential, even leaving some things unsaid — for the reader to fill in. This also makes a familiar (but important) point about painting in the age of mass-produced photographic images: A travel brochure can acquaint us with the physical details of the beach at La Garoupe, but it takes an artist of Picasso’s calibre to make us feel the pure emotions so intensely. Picasso’s first version is like a collection of ideas about the beach all jumbled together and not producing much emotion. Only when he eliminates the clutter and discovers what’s important to him does he create a work of lasting joy. As he says in the film: “Now that I know where I’m going, I’ll get a new canvas and start over.” If the composer of the film score really understood the difference between the two paintings, he would have scored the second very lightly — perhaps a sparse flute trio rather than an overblown orchestral honk. What Picasso actually achieves in the second painting is a feeling of lightness and joy; but the film ends with a noir sequence that makes him out to be The Incredible Painting Man — freakishly good, and the possessor of a frightening artistic legacy. Such histrionics probably helped inflate the price of paintings. 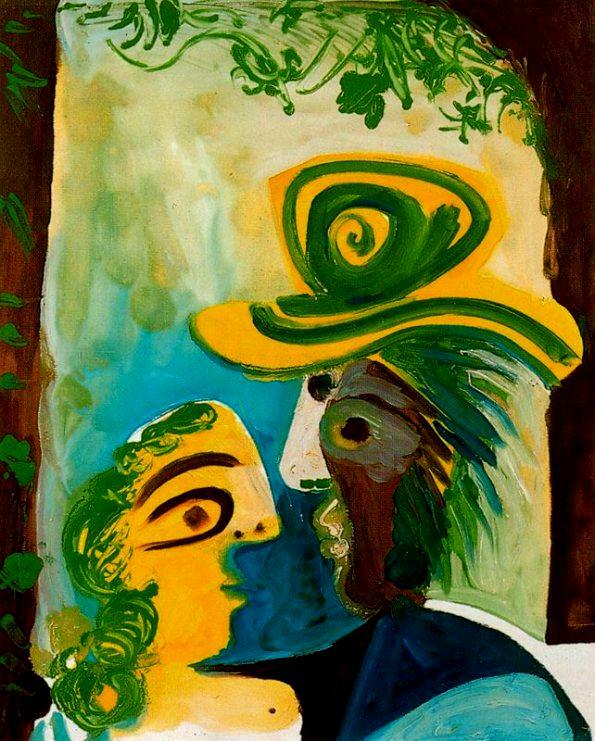 Just as his daughter Paloma became a designer of fashion accoutrements, Picasso himself was by the late 1950s a designer brand prized by the rich, and he knew it. This didn’t stop him from doing some good work; it made it possible for him to move in any direction that he pleased. Still, by the late 1960s he had ceased being a stylistic innovator, and was content to continue working with styles and techniques he had already mastered. Picasso was keenly aware of the modern dilemma faced by artists in all fields: on the one hand, tremendous freedom and opportunity; on the other hand, no rules or clear idea how to proceed. Picasso’s response was to ransack history for every conceivable style that could be of use to him, then go beyond them, creating new styles. 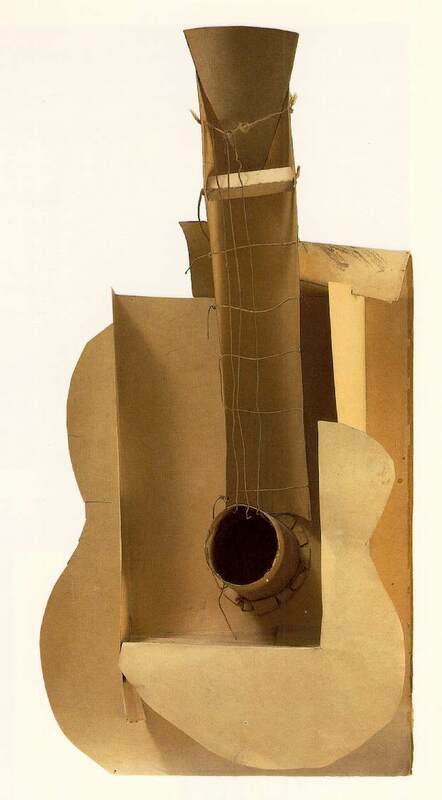 Another guitar from Picasso, this one a 1912 sculpture. I can hardly understand the importance given to the word research in connection with modern painting. In my opinion to search means nothing in painting. To find is the thing. Nobody is interested in following a man who, with his eyes fixed on the ground, spends his life looking for the purse that fortune should put in his path. The one who finds something no matter what it might be, even if his intention were not to search for it, at least arouses our curiosity, if not our admiration. Among the several sins that I have been accused of, none is more false than that I have, as the principal objective in my work, the spirit of research. When I paint, my object is to show what I have found and not what I am looking for. In art intentions are not sufficient and, as we say in Spanish, love must be proved by deeds and not by reasons. What one does is what counts and not what one had the intention of doing. We all know that Art is not truth. Art is a lie that makes us realize truth, at least the truth that is given us to understand. The artist must know how to convince others of the truthfulness of his lies. If he only shows in his work that he has searched, and re-searched, for the way to put over lies, he would never accomplish anything. The idea of research has often made painting go astray, and made the artist lose himself in mental lucubrations. Perhaps this has been the principal fault of modern art. The spirit of research has poisoned those who have not fully understood all the positive and conclusive elements in modern art and has made them attempt to paint the invisible and, therefore, the unpaintable. They speak of naturalism in opposition to modern painting. I would like to know if anyone has ever seen a natural work of art. Nature and art, being two different things, cannot be the same thing. Through art we express our conception of what nature is not. I also often hear the word evolution. Repeatedly I am asked to explain how any painting evolved. To me there is no past or future in art. If a work of art cannot live always in the present it must not be considered at all. The art of the Greeks, of the Egyptians, of the great painters who lived in other times, is not an art of the past; perhaps it is more alive today than it ever was. Art does not evolve by itself, the ideas of people change and with them their mode of expression. When I hear people speak of the evolution of an artist, it seems to me that they are considering him standing between two mirrors that face each other and reproduce his image an infinite number of times, and that they contemplate the successive images of one mirror as his past, and the images of the other mirror as his future, while his real image is taken as his present. They do not consider that they are all the same images in different planes. The several manners I have used in my art must not be considered as an evolution, or as steps toward an unknown ideal of painting. All I have ever made was made for the present and with the hope that it will always remain in the present. When I have found something to express, I have done it without thinking of the past or of the future. I do not believe I have used radically different elements in the different manners I have used in painting. If the subjects I have wanted to express have suggested different ways of expression I have never hesitated to adopt them. I have never made trials or experiments. Whenever I had something to say, I have said it in the manner in which I have felt it ought to be said. Different motives inevitably require different methods of expression. This does not imply either evolution or progress, but an adaption of the idea one wants to express and the means to express that idea. 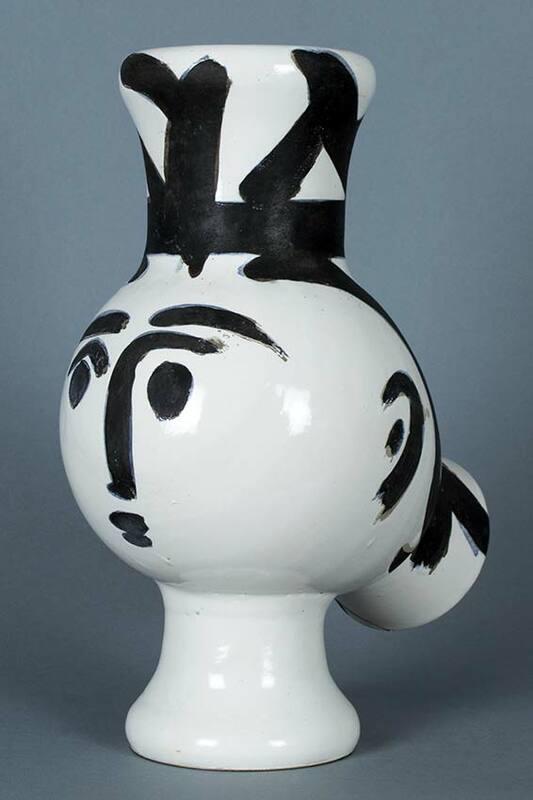 Nevertheless, I can’t help feeling that in his ceramics, Picasso was evolving toward greater simplicity, even as Matisse was with his late period cutouts. Picasso’s “Chouette Femme” (Owl Woman), produced in 1950 at the Madoura pottery in Vallauris. To live in the present moment, to create art in the present moment, and to recognize that all past ages are with us — these are ideas which point to something spiritual in Picasso. The present moment is, perhaps, not a mere second in time, but more like the prow of a ship cutting the water towards the future, but carrying with it (in the body of the ship) all the past ages which are part of the present moment. One unbroken moment in time encompassing all history, but always in the present. We’ll talk more about Picasso’s ceramics next time, as well as surveying paintings from different periods in his artistic life. I do hope you’ll click on Part 2, which is the heart of this three-part series. It has the most pictures, slideshows, video clips, and reveals the most striking contrasts between works. Note: A limited number of digital reproductions of Picasso’s works are included here for educational purposes and to promote awareness of his contributions as an artist. Some or all such works may be copyright Estate of Pablo Picasso/Artist Rights Society (ARS), New York. Special thanks to the Masterworks Fine Art Gallery of Oakland Hills, California, which has many exquisite Picasso ceramics and linocuts for sale.